Old Indy 500 Broadcasts: What Attracts Us? Another interesting item, a URA midget race from Gilmore Stadium in 1948. Some of the drivers in the race include Bill Vukovich, Bobby Ball, Rodger Ward, and Walt Faulkner. If it's what I think it is that one has been floating around for a long time. About twenty years ago I had a contact in the LA who was going to get me a copy but somehow that never happened. OTOH, it might have been an entirely different race since many of the races were covered live at the time. It was not uncommon during the heyday of radio for local radio stations to broadcast auto races, even through the 1950's and 1960's. I have to wonder if any of those still might exist in an archive, if they were ever recorded, or have been lost for all time. Tony Hulman, who owned radio station WTHI in Terre Haute used to have the sprint car races at the Vigo County Fairgrounds covered live. That coverage included qualifications, heats, and the actual feature. There was at least one time that Sid Collins sat in with the regular broadcasters to add some color. True. Mike King was still calling features into the 1990's. WTAX in Springfield was a regular fixture at the Illinois State Fair races into the 1960's. WDQN in DuQuoin called auto racing at the DuQuoin State Fair into the 2000's. The best part is finding someone unfamiliar with Indycar and betting on the race. But seriously- It's like a favorite movie we've seen countless times but enjoy it every time it's shown. I gave you something of a generic answer, sorry about that. I believe that when Jim Shelton and Sid were assigned as turn announcers for Mutual they were actually stationed in the short chutes, sitting in a small stand at the outer wall. Later, when the Network came into being and they went with 4 turn announcers and a back stretch man, turns 2, 3, 4 were at the outer wall. I am not sure about turn 1 which might, might have been on one of the platforms under the upper deck. Some of these positions moved around as stands developed etc. There was an observers stand on the inside of the back chute that I believe Howdy Bell occupied when he was assigned there. I'm pretty sure Jim Shelton moved to the top of one of the turn 4 stands after they were constructed. I think during the Mutual years, the two turn announcers ("South Turns" and "North Turns") were sometimes stationed in the infield of the short chutes. The turn one announcer started out in E, then in the 60s at some point moved to the then-new SW Vista Deck. Then at some point went back to the E (overhang under the Penthouse). Now it's been vacant for a handful of years. 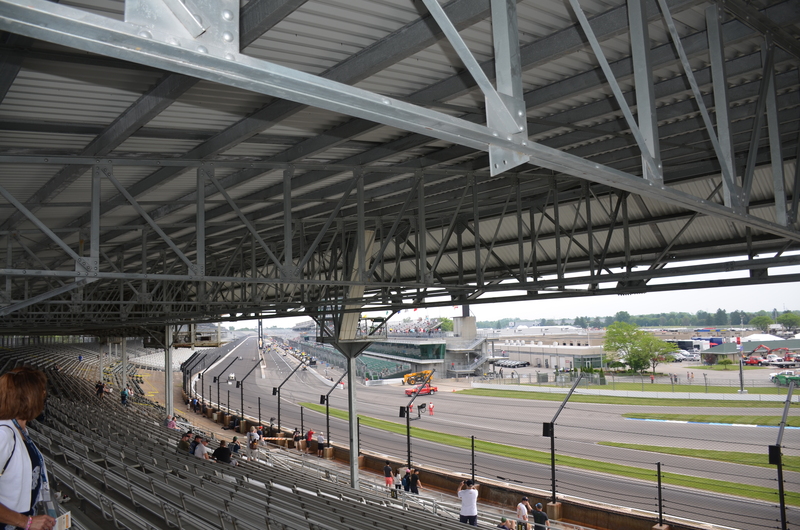 They say it's because the announcers in the Pagoda have a full clear view of turn one, and having someone there just is not needed. Plus it was Jerry Baker's spot, and I wonder if he doesn't care to climb up there anymore. Howdy Bell in turn two was in a small observer's shack on the outside wall, then eventually moved to the roof of the Turn Two Suites. Nowadays the turn two announcer is atop the SE Vista. For a long time the turn four announcer was atop the NW Vista. I think now they moved the announcer a little downstream and it's from the top of J Stand. What's often forgotten is that the early IMS Pit Reporters were actually using Indiana Bell telephone handsets that were plugged in and connected to the broadcast. They had zero mobility and just a few reporters covered the entire pits so they often weren't close to the leaders' pit. When they did do interviews they had to use the handset as a microphone. I'm not sure but I think the Bell telephone wired in handsets were in use well into the 1970s by the USAC observers. Yes the pit reporters were wired until the late 1970s. In 1971 they made a big deal about Bob Forbes being a "wireless" roving reporter covering the garage area, etc. And the sound quality of his connection much inferior. Through 1973, they had three pit reporters, each assigned to observe/report roughly 11 pit stalls (south pits, center pits, north pits). And back then, there actually weren't as many pit stalls used south of the Gasoline Alley opening. (It was 1991 when they opened up more pits down there, for safety after the Dismore crash). The top cars were more spread out down the pit lane...without the packup rule under yellows, the strategy of wanting a pit stall as far south as possible hadn't come into play yet. it was more about having an opening before or after. Then when they lengthened the pit road in 1974, they added a fourth pit reporter. So now each only had to observe roughly 8-9 stalls. And when cars dropped out (which happened back then), they could start zeroing in on who was left as a contender. But if you listen carefully to when they would throw it to the pit reporters, you could tell back then it was almost always in the past tense. They ran down to watch a pit stop, then hurried back to their mic station. Pit reporters would call up to the producer in the booth and indicate they had something to report on. Then Sid would throw it down to them if he felt like it. It wasn't until Bob Jenkins came in that he introduced a pit producer to coordinate the pit reporting. By then they were fully mobile. The pit producer would sort of "lobby" for the reporters to get their report on air...preferably live. But since times had changed, the pit stops were so much more important to the race running that they were integral. I was listening to the 1985 Indy 500 this past weekend and the wife said: Why do you listen to those old races over and over, you already know who won..........and that got me to thinking..........what is it that attracts me most? 1. The history and tradition: The broadcasts take me back to the time in my life when the race was live....I think of the times in which the race took place, how old I was, where I was at in life at the time, did I go to the race that year?, etc. 2. The word picture painted by the wonderful track announcers is almost like watching a play unfold. The announcers can take me there and the coverage is excellent. Even in the 60s with low technology, they do a great job of taking me there. 4. Pretending I do not know who won and just listening to the announcers excitement as they describe the action. 5. The History..........each race year is a new chapter and listening to an old broadcast is like looking at an old yearbook. 6. We watch movie reruns..........so why not listen to old races? 7. No matter how many times I have listened to a particular race, they never get old. 9. Gets me excited for the coming race........I have 35 races that are digitized and my plan is to listen to them all before the 2015 Indy 500. 10. I love the prerace broadcast almost as much as the race............I love the introduction of the announcers and each announcer welcoming the audience. The reading of the starting field and of course the somber prerace ceremonies. I think we all had some hope that those networks that replaced SPEED would have dedicated programming to races from the past for all formats - would have even been cool too see those old NASCAR races where the cars actually looked different. F1 Decade came close but in order to spur my interest I needed to go even further back. So I was blessed to scored some E Penthouse seats in 2015 from a kind TF gent, and ran into Jerry Baker up there on the walkway behind the EPH bleachers the morning of the race. I never went to the race as a kid, and so his voice was one that was synonymous with the race for me. I shook his hand and let him know how I had listened to him since I was a kid. He was friendly and then he and his wife entered a trap door of sorts and climbed down a ladder toward his perch hanging from the EPH stand. Not an easy climb. They had a cooler and whatnot, and had just seemed like any other sweet elderly couple who were spending yet another raceday at the track together, except for I would hear his booming voice in my headphones an hour or so later as the blur of colorful machines roared toward us in 1. It's right up there with my favorite moments at the 500. It's one of the biggest sports venues in the world, but also one where the common man has the chance on occassion to have a personal encounter with a participant or past legend. Here's the perch ("trapdoor"), as seen from E Stand. Listening to the 1985 radio broadcast, Ron Carrell was describing that it was new that year, so the first year to use that overhang was 1985. 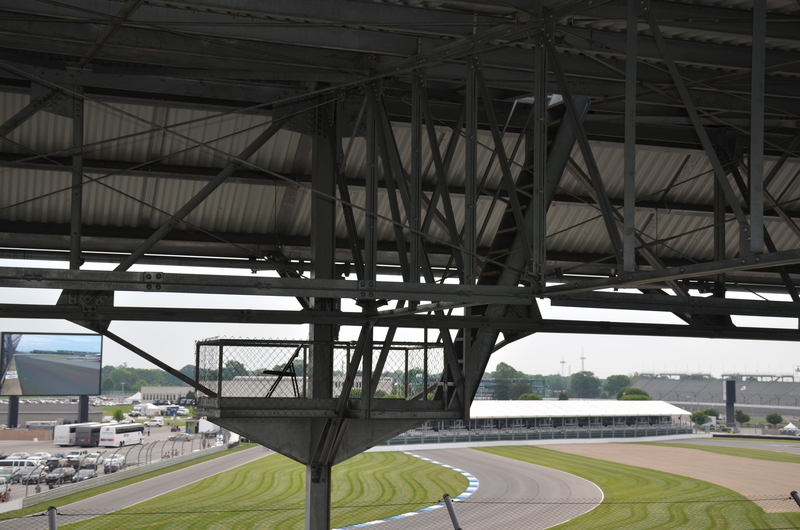 Previously the turn one announcer was atop the SW Vista, as well as other positions perhaps. Last edited by Doctorindy; 04-17-2019, 10:35 PM. Which Section and Row is this photo taken from? "The track will choose who's going to win." That's a good question. I don't really know. That picture was taken the day before the race (Saturday morning, Legends Day). I was just wandering the grounds taking pictures of some random things. Here's another picture taken a little further down, showing a different angle. We might be able to figure out the section through this one. EDIT...After looking at some other pictures and guides, I think that first photo was taken from the top row of E Stand, between Sections 5 and 6. They seem to go back and forth with it. Sometimes a turn 1 guy, sometimes not.